Posted in: Lego News, video. Tagged: DC Comics, Lego Videos, Poster, The LEGO Movie. It’s mostly the same as the first LEGO Movie Trailer but there are a couple of new scenes and it’s still funny. Is anyone else thinking that February 2014 can’t come fast enough? Posted in: Lego News, Official Sets. Tagged: LEGO, Poster, Series 9 Minifigures. Lego has released it’s renderings of the upcoming series 9 mini figures. Due out in stores in January, you can expect there will be some that make it out a little sooner. Personally, there are some great figs here but others leave me a less than excited. I’m especially fond of the forest girl, and the policeman as with most of the series mini figures it’s the details that make these stand out. What are your favorites? let us know in the comments. Posted in: Lego News. Tagged: Aragorn, LEGO, Lord of the Rings. Return of the King, LOTR, Poster. Unless you’ve been hiding under a rock, or you just came out of you dark ages, you’ve heard by now that LEGO will be releasing Lord of the Rings (LOTR) themed sets beginning this summer. Between now and then you can check Lego’s newly minted micro site LordoftheRings.Lego.com for more information and news, and check back here we’ll surely update you as news filters in. 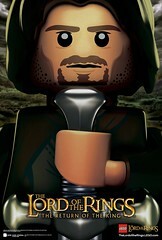 And in case you need a reminder, or to show of your inner geek, LEGO has released a new Return of the King poster featuring Aragorn for you to download print, and enjoy. Click the image to be taken to a full size image that you can download and print to your hearts content.